Ladies and Gentlemen, it’s time to take it to the next level and plan a party at our Narragansett hotel. Rally your crew for the big game or a GNO (that’s Girls Night Out for the uninitiated) between October 15-April 30 at Chair 5’s rooftop lounge at The Break, and leave the hosting duties – and cleanup – to us. You may have already heard that our rooftop lounge at Chair 5 is open to the public, serving bar bites and custom artisan cocktails. But did you know that it also offers two tucked away TV alcoves with comfy sectional couches with room for six? The Patriots are in their usual fine form this season, and no one wants to miss a second of the action. 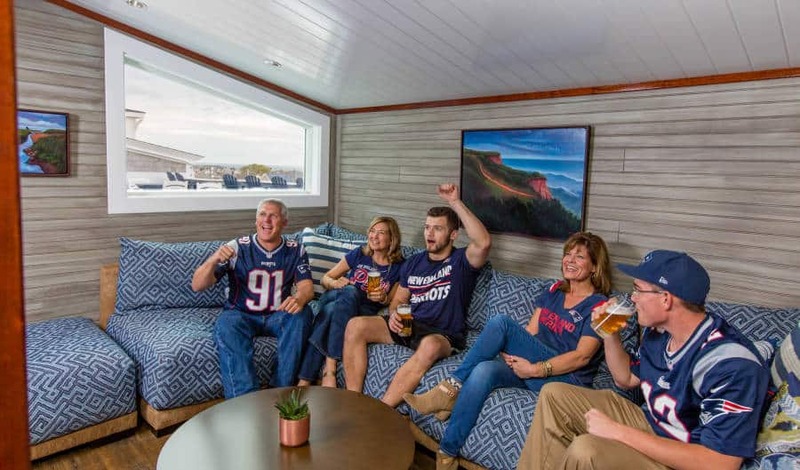 But if the box seats at Foxboro are a bit out of reach, you can lounge with five of your favorite football fans in your own semi-private space, enjoying wings, a round of cold ones, and high-fives all around for every Brady TD. At $150, that’s well worth the price of admission. If your tastes run more towards the Bachelor or Scandal, gather your girls in style for some binge-watching or a much-anticipated season finale. For $150, sip mini splits of Prosecco and munch on a selection of Chef Basil’s famous snacks – think hand cut potato chips and local oysters – while you predict who will get the final rose (insert dramatic music here). Before you head out, indulge in a little retail therapy with a 15% discount in our boutique. You’ll have more than TV to talk about the next day at the office. This one has #squadgoals written all over it. Get all the fine print here, and if you or anyone in your party wants to stay over for the night, check out our Staycation Escapes.